Is It a Frog, a Bullfrog, or a Toad? Home » Enjoying Nature » Is It a Frog, a Bullfrog, or a Toad? Our frogs and bullfrogs often look very much alike. They both have thin, moist, smooth skin, long, powerful back legs and webbed feet. They both can be various shades of green or brown and have dark spots and stripes across their legs. Our toads are easier to identify. 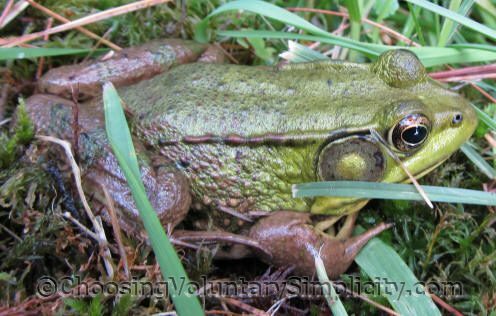 This is a Northern Green Frog. It has prominent folds of skin called dorsolateral ridges that extend along both sides of the back in a straight line from just behind the eye almost to the rear legs. 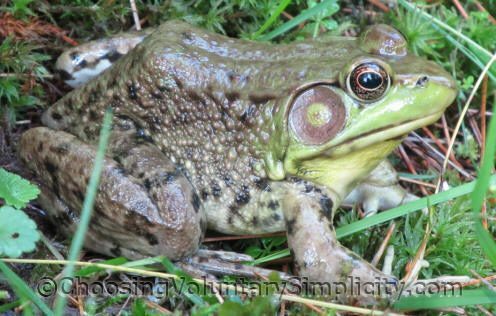 This is a North American Bullfrog. It also has ridges of skin, but they begin at the eye and curve around the eardrum, ending at the front leg. It does not have the straight dorsolateral ridges along its back. 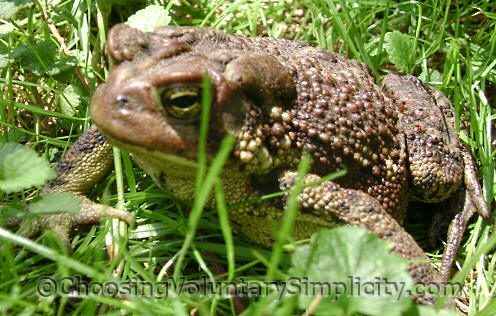 This is an Eastern American Toad. It has thick, dry, bumpy skin, a stubby body, and shorter back legs with individual toes. It has large swellings called partoid glands behind the eyes and raised ridges called cranial crests on the back of the head. It does not have dorsolateral ridges. These photos are amazing. I have never seen such upclose and clear photographs of nature like you have. I am 92 years old and I have lived in the country all my life but until I read this I never knew how to tell which of the frogs were bullfrogs. I guess it’s never too late to learn something new. Thank you for sharing your life with us. I truly enjoy this blog. Wow!!! I agree – the photo’s are amazing. I have been reading your blog for about 3 years and can’t get enough. Keep up the good work!!! I agree, Shirley! Frogs and toads should never be kept in captivity. They are an invaluable part of the natural world. If you love them and want them up close or at least be able to see them frequently, may I suggest a “toad house”. I use broken pottery pots set out in the garden with an opening they can get to. Kids and grandkids can help set these out or make their own and at the same time learn about our froggy friends. When a child understands and feels protective of part of the natural world they are more likely to grow up appreciating all life as valuable. Here, here, Shirley and Jo! We enjoy both frogs and toads as visitors to our garden…NOT our home. I like to think of them as my own personal little bug eating army. :) My whole family looks forward to hearing their “songs” in early spring. Thank you. I’ve been trying t identify the frogs hanging around my goldfish pond. 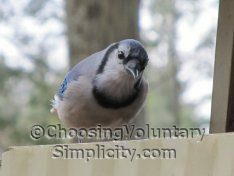 Your site gave me the clearest pics and straightforward info.